When I was in Ontario, having tests done to verify my Human Guinea Pig Status, I spent a few days in Toronto with my Baby Brother. When The Remix and I were visiting in August, he took us to an ah-mazing burger joint called The Burger's Priest. It required a bit of a drive, as it was clear across the city but my BB said that it was worth it. And he was right. Very, very right. So, naturally, when I was back visiting with him a few weeks ago, I was all: TAKE ME TO THAT BURGER PLACE. And he was all: GET IN THE CAR. (I really love my BB). Naturally, my next step was a frazzled text to my BB, asking him if he was aware of The Secret Menu. Just to clarify, I LOVE being in the know, so even though all of the burgers on The Secret Menu are far more intense than any burger I'd regularly eat, I couldn't resist. So, I spent a considerable time drooling profusely going through the options. Simply described as: A double cheeseburger squeezed between two grilled cheese buns. 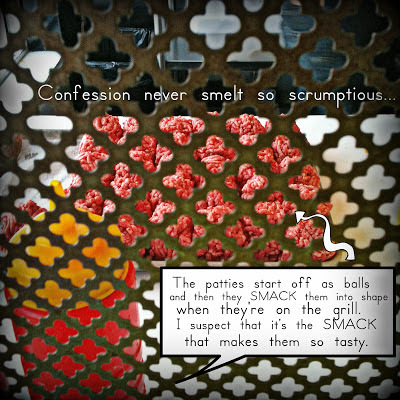 From my pervious Priest experience, I knew that the meat was DELICIOUS, and so were the buns. So, as far as I was concerned, having two patties AND two grilled cheese sandwiches was pretty much the best secret burger ever, despite the burger potentially being bigger than my head. A few hours after my formal decision, BB and I were off in search of copious amounts of beef, along with one of BB's closest friends, The Recently Liberated Pal, and The Fisch. We took BB's new pseudo-rocket-ship car (A Subaru STI) and ventured out to The Beaches (apparently, it's now called The Beach but I'm not super into that because it reminds me of that movie with Leo Dicaprio and, rest assured, that part of the city is NOTHING like the movie. Therefore, I will continue to refer to it as The BeachES). Anyway, we get to the restaurant--if you can call it that because there's nowhere to sit and there are signs, actual signs that read: No consumption on the premises. Seriously. They really don't want you eating there. The reason? It's TOO DAMN BUSY! There are also signs on the front door that tell you not to block the neighbouring convenience store or crowd the sidewalk. Why they chose to have such a small establishment, I don't quite know, but it is what it is. The Recently Liberated Pal was a smarty-pants and opted to order a "pre" burger, as in, a burger that he'd eat before getting into the car, but The Fisch and I stood strong with our single orders, despite the mouth-watering scents that wafted from the grill. After all, we knew that we were gearing up for some serious burger tastiness that was at least double to the average amount of food that we were used to eating so we opted to play it safe. I was SO EXCITED when it was my time to order and as The Recently Liberated Pal stepped away from the cash, I approached the female employee with a sneaky smile. 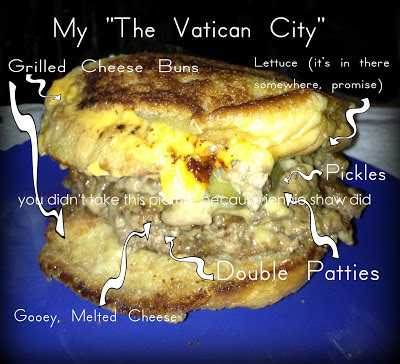 "I'll have The Vatican City, please," I said, raising an eyebrow. "That'll be $11.50," she replied, without so much as a wink. Now, I'm not saying that I was expecting confetti guns or an air horn (okay, maybe a little confetti), but I did hope that there'd be some kind of subtle acknowledgement that I was in The Know. Like a fist pump, or a smirk--SOMETHING. Alas, she really couldn't have cared less and was far more interested in asking me what kind of toppings I wanted instead of letting me bask in the glow of Know-ing-ness. Her lack of reaction threw me for a moment, but my enthusiasm perked up again when I thought about the hugeness of the burger that was being cooked to perfection by one of the three young but burger-savvy cooks behind the in-theme counter. "Jennie? The Vatican City?" one of the burger-savvy cooks called out. Shortly after, the other orders were ready and then we were off. On the way to the car, I noticed that not only was the brown paper bag already soaked with grease, but there was a good chance that the weight of the burger would eventually rip through the weakened paper. So, with a hand firmly underneath the bag to counteract gravity's desire to destroy my two-to-three pound burger, we headed back to BB's condo. And it was there, at his long wooden coffee table, where I saw the full glory that was The Vatican City. Of course, it took some time to determine an appropriate plan of attack and after a few failed bites where I got only one patty and one grilled cheese sandwich, I had no choice but to patty down, which is why the title of this post is: I "almost" ate an enormous secret burger. Yes, it seems like I was giving up but my little mouth just isn't equipped for such a significant stack of deliciousness. But even though I went single patty on The Vatican City, it.was.amazeballs. Kind of like eating two grilled cheese sandwiches made out of clouds, sandwiched around fall-apart patties of happiness (even though they were pickle light). 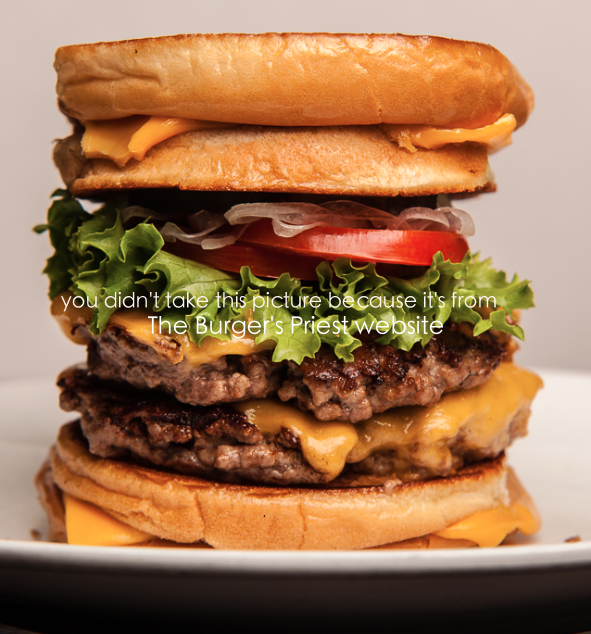 So, if you're ever in Toronto, and have a hankering for an off-the-chain burger, head on over to The BeachES and check out The Burger's Priest. And if you're feeling extra-ambitions, take a moment to peruse The Secret Menu. No, you won't get any props, but there's still something cool about ordering from a menu that isn't posted. And if you decide to go the traditional route, take a note from The Recently Liberated Pal and get a burger that you can eat immediately. I know that next time, I will! Now I am starving so thanks for that but I also love secret menus and have read tons of forums about them which actually might make me a little odd but o well! Wow - just WOW!!!! WHEN I get back to Toronto I will for sure be stopping at that place and ordering the exact same thing you got! I mean it looks crazy awesome!! This sounds amazing and like a place I need to go! I'm jealous, I always want to get to use secret code words! It's practically sacrilege to take a Burger's Priest burger off premises -- you think it was good after 20 minutes? It's phenomenally better when it's eaten fresh off the grill, before it's been tipped and soaked through! Burger Priest is next on my list! Next time you're in town, tell BB to take you to Holy Chuck which is pretty close to Priest at Yonge/St Clair. They've got grilled cheese buns and then some!